Would You Opt For An Organic Pod Burial? : 13.7: Cosmos And Culture Anthropologist Barbara J. King checks out a new project that will offer fetal-position, tree-topped burials in underground pods. Capsula Mundi aims to provide an organic burial pod with a tree growing from the top. It's a familiar conversation in our house. When my husband dies, he wants to be cremated, with his ashes scattered in beloved locations ranging from the river behind our house to national parks including the Grand Canyon. But me? I want to be buried in the earth. 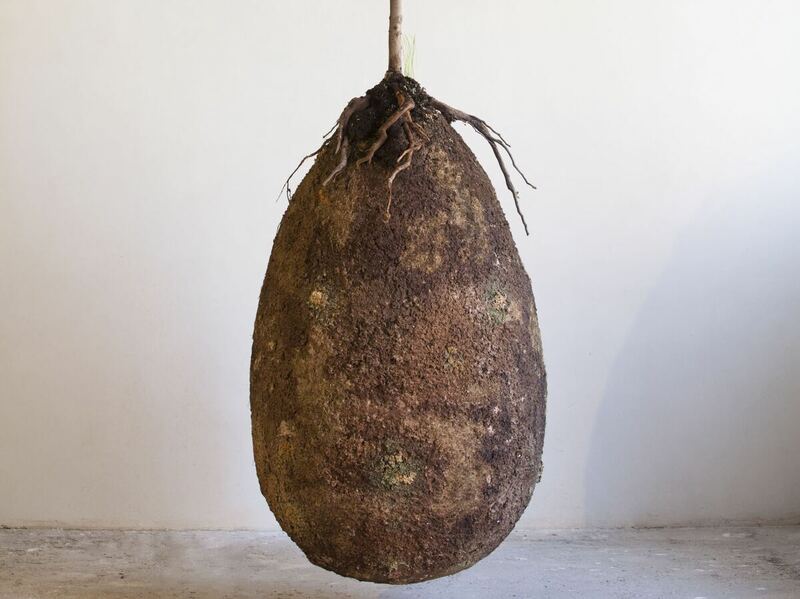 And I have a new goal: leaving behind the idea of a traditional coffin in favor of burial in a biodegradable egg-shaped pod in a curated forest. I've just discovered this option, still in its design phase, so not actually available yet. Which is all right with me, since I hope not to need the pod too soon. "Ashes will be held in small Capsulas while bodies will be laid down in a fetal position in larger pods. The pod will then be buried as a seed in the earth. A tree, chosen in life by the deceased, will be planted on top of it and serve as a memorial for the departed and as a legacy for posterity and the future of our planet. Family and friends will continue to care for the tree as it grows. Cemeteries will acquire a new look and, instead of the cold grey landscape we see today, they will grow into vibrant woodlands." In death, becoming a seed for a tree and thus for new life — that's an image I love. Capsula Mundi's FAQ page offers other appealing details, including a plan for capsules adapted for companion animals, too. "The material of the Capsula is a bio-polymer which is a polymer derived from seasonal plants. It is completely biodegradable and, if buried, becomes decomposed by microorganisms in the ground. This kind of material does not impede the natural transformation of organic substances of which we are made and allows the organic matter to transform into minerals, integrating the earth with nutrients for vegetative organisms. A tree will be planted over the buried Capsula, so a new form of life starts living and gives back oxygen and nutrients for others living species." So, unlike a tree being cut down to make a traditional coffin, with Capsula Mundi, a tree is planted — and, yes, the plastic is environment-friendly after all. Citelli and Bretzel told me that green burials are outlawed in Italy. This is a situation they hope to change; a petition is already underway. Meanwhile, "very soon" they will launch production of Capsulas in the version sized for ashes, aiming at countries where the pod burial is already legal. The next phase will involve work on the body-sized Capsulas that sparked my interest. It's for professional reasons as well as personal ones that I'm thinking about unconventional burials just now. In April, I'll give talks in northern Virginia and in Santa Fe, about an evolutionary perspective on grief, dying and death. As I've written here before, responses to their relatives' and companions' deaths by wild elephants, monkeys and house cats may include profound grief. Elaborate rituals around death and burial are, at least as far as we know, fully bound up with human culture and discourse. Beautiful traditions may be part of the human response to dying and death, as we can see when music thanatologist Jennifer Hollis explains why she plays the harp for people who are dying. Burial practices can, as Capsula Mundi hopes to show, be beautiful, too.